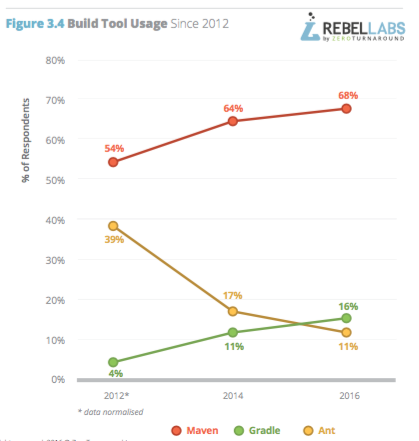 Today, ZeroTurnaround's RebelLabs released their biannual developer productivity report for 2016, which asked over 2000 respondents what their tools of the trade were. These included questions on IDEs, build tools, libraries, and whether they were more or less likely to be ahead of the trend as early adopters, or laggards in the form of technology sheep. Perhaps unsurprisingly, the version control system wars are uncontroversially over, with Git holding the de-facto space for projects used by respondents. SVN continues to decline at a rate matching the adoption of Git, while CVS and Mercurial continue to asymptotically approach zero. The build tool usage continues to show Maven dominant (and rising) in the automated build systems, with Gradle ascending slowly as Ant's demise continues. 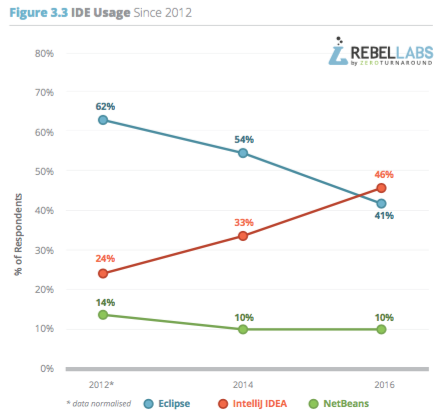 Finally, the report also shows that Java 8 has finally taken the crown as the most used version of Java, although Java EE continues to slide and be replaced by Spring services. For more information, read the full report. Why is Eclipse's decline in the report seen as being "slightly more controversial" and why does the author of the article need to bring up Eclipse Neon? The same kind of argument and supplemental info could have been provided for any of the other technologies showing a decline? Or should that phrase be something like "Slightly more controversially to this specific author, since I have authored books on Eclipse and am invested in its community and I believe it is a great product and would like to defend it a bit here..."